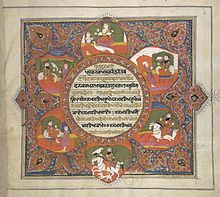 The Sikh scriptures use Hindu terminology, with references to the Vedas, and the names of gods and goddesses in Hindu bhakti movement traditions, such as Vishnu, Shiva, Brahma, Parvati, Lakshmi, Saraswati, Rama, Krishna, but not to worship. [self-published source] It also refers to the spiritual concepts in Hinduism (Ishvara, Bhagavan, Brahman) and the concept of God in Islam (Allah) to assert that these are just "alternate names for the Almighty One". After the martyrdom of Guru Arjan, his son Guru Hargobind at age eleven became the sixth guru of the Sikhs and Sikhism dramatically evolved to become a political movement in addition to being religious. Guru Hargobind carried two swords, calling one spiritual and the other for temporal purpose (known as mīrī and pīrī in Sikhism). [self-published source] According to the Sikh tradition, Guru Arjan asked his son Hargobind to start a military tradition to protect the Sikh people and always keep himself surrounded by armed Sikhs. The building of an armed Sikh militia began with Guru Hargobind. Guru Hargobind was soon arrested by the Mughals and kept in jail in Gwalior. It is unclear how many years he served in prison, with different texts stating it to be between 2 and 12 years. He married three women, built a fort to defend Ramdaspur and created a formal court called Akal Takht, now the highest Khalsa Sikh religious authority. The Sikh Khalsa's rise to power began in the 17th century during a time of growing militancy against Mughal rule. 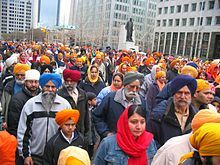 The creation of a Sikh Empire began when Guru Gobind Singh sent a Sikh general, Banda Singh Bahadur, to fight the Mughal rulers of India[self-published source] and those who had committed atrocities against Pir Buddhu Shah. Banda Singh advanced his army towards the main Muslim Mughal city of Sirhind and, following the instructions of the guru, punished all the culprits. 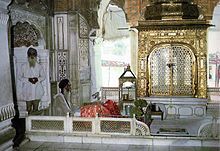 Soon after the invasion of Sirhind, while resting in his chamber after the Rehras prayer Guru Gobind Singh was stabbed by a Pathan assassin hired by Mughals. Gobind Singh killed the attacker with his sword. Though a European surgeon stitched the Guru's wound, the wound re-opened as the Guru tugged at a hard strong bow after a few days, causing profuse bleeding that led to Gobind Singh's death. ^ "Major Religions of the World Ranked by Number of Adherents". Adherents.com. 2005. Retrieved 19 June 2010. ^ a b Singh Gandhi, Surjit (1 February 2008). 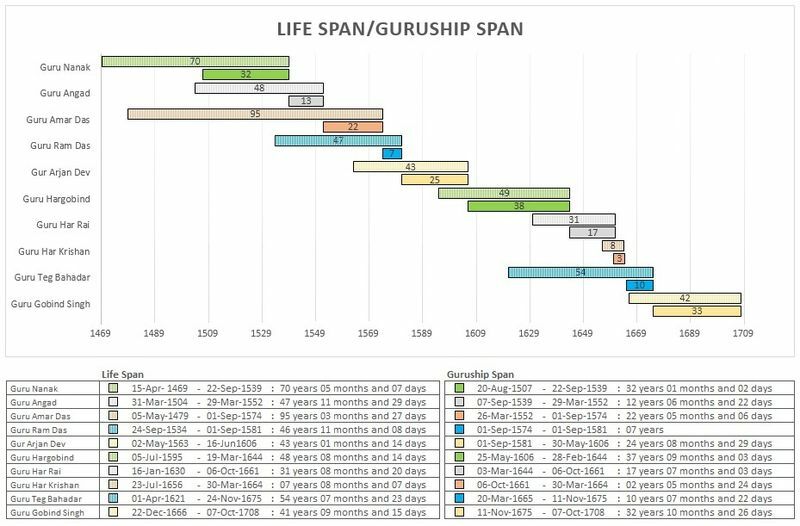 History of Sikh Gurus Retold: 1606–1708. Atlantic Publishers & Distributors Pvt Ltd. pp. 676–677. ISBN 978-8126908578. ^ Chahal, Devinder (July – December 2006). "Understanding Sikhism in the Science Age" (PDF). Understanding Sikhism, the Research Journal (2): 3. Retrieved 10 November 2013. ^ Torkel Brekke (2014). Gregory M. Reichberg and Henrik Syse (ed.). Religion, War, and Ethics: A Sourcebook of Textual Traditions. Cambridge University Press. p. 672. ISBN 978-1-139-95204-0. ; Quote: "As an Indian religion, Sikhism affirms transmigration, the continued rebirth after death..."
^ Dhillon, Bikram Singh (January – June 1999). "Who is a Sikh? Definitions of Sikhism" (PDF). Understanding Sikhism – the Research Journal. 1 (1): 33–36, 27. Retrieved 29 November 2013. 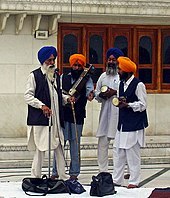 ^ Dhillon, Sukhraj Singh (May 2004). "Universality of the Sikh Philosophy: An Analysis" (PDF). The Sikh Review. Archived from the original (PDF) on 4 December 2013. Retrieved 29 November 2013. ^ Kaur Singh; Nikky Guninder (30 January 2004). Hindu spirituality: Postclassical and modern (Editors: K.R. Sundararajan, Bithika Mukerji). English: Motilal Banarsidass. p. 530. ISBN 978-8120819375. ^ a b c Pashaura Singh (2001). "Sikhism and Restorative Justice:Theory and Practice – Pashaura Singh". In L. Hadley, Michael (ed.). The Spiritual Roots of Restorative Justice (SUNY Series in Religious Studies). State University of New York Press. pp. 199–202. ISBN 978-0791448526. ^ Pashaura Singh (2012). John Renard (ed.). Fighting Words: Religion, Violence, and the Interpretation of Sacred Texts. University of California Press. p. 213. ISBN 978-0-520-95408-3. ^ Pashaura Singh (2001). "Sikhism and Restorative Justice: Theory and Practice". In L. Hadley, Michael (ed.). The Spiritual Roots of Restorative Justice (SUNY Series in Religious Studies). State University of New York Press. pp. 202–207. ISBN 978-0791448526. ^ Singh Gandhi, Surjit (1 February 2008). History of Sikh Gurus Retold: 1469–1606 C.E. Atlantic Publishers & Distributors Pvt Ltd. p. 265. ISBN 9788126908578. ^ Ron Geaves (2011). Fabrizio Ferrari (ed.). 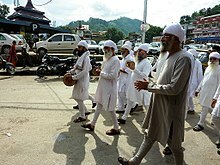 Health and Religious Rituals in South Asia: Disease, Possession and Healing. Taylor & Francis. pp. 48–51. ISBN 978-1-136-84629-8. ^ Hardip Singh Syan (2014). Pashaura Singh and Louis E. Fenech (ed.). The Oxford Handbook of Sikh Studies. Oxford University Press. pp. 170–180. ISBN 978-0-19-969930-8. ^ a b Opinderjit Kaur Takhar (2014). Pashaura Singh and Louis E. Fenech (ed.). The Oxford Handbook of Sikh Studies. Oxford University Press. pp. 350–359. ISBN 978-0-19-969930-8. ^ Verne Dusenbery (2014). Pashaura Singh and Louis E. Fenech (ed.). The Oxford Handbook of Sikh Studies. Oxford University Press. pp. 560–570. ISBN 978-0-19-969930-8. [b] Nesbitt, Eleanor (2000). Coakley, Sarah (ed.). Religion and the Body. p. 299. ISBN 9780521783866. But for many Sikhs it is as unthinkable as it would be for many Hindus that a holy person as the Guru could have eaten flesh. 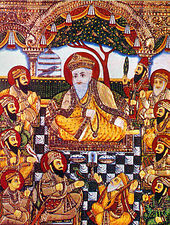 Although Guru Gobind Singh is said to have prohibited only halal meat (animals slaughtered in accordance with Muslim requirement), amritdhari (initiated) Sikhs commonly feel committed to a diet free of eggs, fish, and meat of any kind. Contemporary movements within the panth, no less than earlier ones, are characterised by their ruling on non-vegetarian food. ^ Siambhi, Piara Singh (2004). Mann, J.S. ; Sodhi, S. S. (eds.). 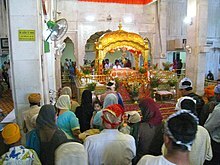 Concepts in Sikhism. p. 234. Not many Sikhs are habitually meat-eaters. Their staple diet mainly consists of cereals, pulses, vegetables and milk products.